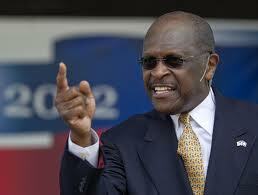 You can’t say we didn’t warn you about Herman Cain! Our May 21st Post was very clear on this point. Herman is no joke. Now that the NY Times / CBS Poll shows him comfortably in the lead we will make our next Herman Cain prediction. Guess who’s coming to dinner at the GOP convention. Look for him as the Vice Presidential nominee, because he creates the illusion of inclusion, which the GOP badly needs, while still appealing to the extreme right with good old-fashioned trickle down economics and the most regressive tax plan in the nation’s history. This entry was posted in America, Economics & Finance, Frivolity, Politics and tagged Herman Cain, Herman Cain front runner. Bookmark the permalink.